Take the stress out of your next big move with help from the experts at Best Price Boxes. Our moving resource centers offers a fantastic selection of eco-friendly moving boxes. No matter how large or small your moving project may be, we will supply you with all the shipping and packing materials you require. 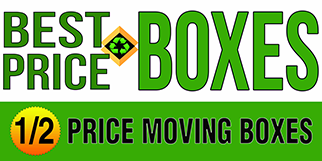 Best Price Boxes is an eco-friendly business that offers a varied selection of new and used moving boxes and packing materials. No longer do you have to pay full price for new or used moving boxes. Best Price Boxes carries the best selection of moving boxes, used moving boxes and moving supplies - even Free Move Quotes! Going green and being environmentally friendly is easy with Best Price Boxes. We sell gently used moving boxes and then pay you money to return the moving boxes to us when you are finished. Current locations: Atlanta, Macon and Savannah GA, Dallas and Ft. Worth TX (DFW), Lubbock and San Antonio TX, Denver, Colorado Springs and Longmont CO, Kansas City, St. Louis MO, Tulsa OK, Mansfield OH, Chicago, Carol Stream, Crystal Lake and O'Fallon IL and Little Rock and Fayetteville AR, and Milwaukee, Charlotte and Raleigh NC. We sell new and used boxes 50% cheaper than other retailers. Our used moving boxes are in good condition with no holes, tears, or stains Enter our online store to place your order for new or used boxes. We buy back your boxes when you are done with them! Plus, delivery is available, please contact the store nearest your for details. Best Price Boxes is proud to announce that you have helped us reuse and recycle over 1.7K Tons of Cardboard in 2018 - That's 24K+ Trees Saved! Congratulations for making the right choice with Best Price Boxes! quality packaging materials for sale.